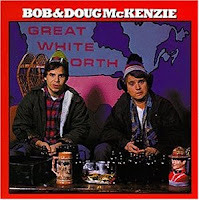 Taking off to the Great White North, eh! I'm off to the Great White North to visit with family and friends in Canada's wine region, the Okanagan Valley of Southern British Columbia. There are about 70 estate wineries spread along the 155 mile Okanagan Valley and certainly some fantastic wines are produced, but B.C. is also home to some great craft-breweries and brewpubs as well. I should have plenty of time to enjoy both on this trip and will hopefully post a few things during my stay. We haven't ordered a pizza from a take-out place in at least a couple of years. My wife bought me a cast iron griddle after watching an episode on the Food Network about grilling pizza and we've been making our pizza and cooking it on the grill ever since. Here's one we made on Friday night that had fresh tomatoes, basil, mushrooms, red onions, garlic and mozzarella. The fresh ingredients with the flavours from cooking on the grill make a pizza that is far superior then any take-out pizza. Being able to wash it all down with a couple of bottles of Independence Austin Amber and Pale Ale makes it even better. Its been a very dark and stormy day and we've been under a perpetual thunderstorm and tornado warning all day. In other words, it looks like the perfect day to drink a bottle of Ommegeddon from Brewery Ommegang. Basically, I dug around in the beer cellar until I found a beer with an ominous sounding name to match the ominous weather outside. I was even able to find my Ommegang glass to drink it with. And if the roof is taken off by a tornado, the best way to save some of my beer at least, is to be drinking it. Ommegeddon is an 8% ABV Belgian-style ale with a dose of Brettanomyces yeast and a blast of dry hopping. The neck label indicates its from Batch #1 brewed in June 2007, so its obviously been in my cellar for almost two years now, but it seems to have held up very well. Oksar Blues Brewery was the pioneer of canning craft beer. More and more micro-breweries are now following their lead, showing that cans are not just for macro lagers and malt liquor anymore. Mama's Little Yella Pils is their newest offering into the Texas market and perfect timing as the scorching summer heat is right around the corner. 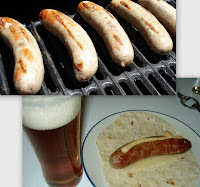 It seems to be a cross between German and Czech style pilsners. I'm not sure how often I'd pick this one up as I prefer a more spicy and crisp flavour and finish, but certainly worth trying. Its bottling day for my American Mild which was inspired by Pride & Joy from Three Floyds Brewing. I say "inspired by" and not a "clone of" since I couldn't find an actual clone recipe after scouring the Internet. Instead, I formulated my recipe after reviewing recipes created by other homebrewers who had attempted to clone this great session beer. I don't have any Pride & Joy to taste test against (I'll accept any that someone may want to mail me), but as long as turns out to be a mild, easy-drinking session beer, I'll be happy. However, before the drinking can begin, there's a lot of work to be done. The beer needs to be transferred and primed and 48 bottles need to be washed, sterilized, filled and capped. But, once that's done, there's nothing left to do but relax, not worry, have a homebrew and wait for it to be ready to drink. It always looks like so much more when its in the glass carboy then after when its been put into 48 bottles. The first Nugget bine is now 15" tall with a couple of more poking up from the mulch. Meanwhile, the first few Cascade sprouts have finally broken through the surface of the mulch. The Cascade rhizome was pretty small with no visible shoots whereas the Nugget rhizome was much larger with several growing shoots when I planted them, so its no real surprise that the Cascade is that much further behind. However, they're now both growing and on their way. Now comes the task of keeping them happy and growing during the scorching hot and humid summers of Houston. 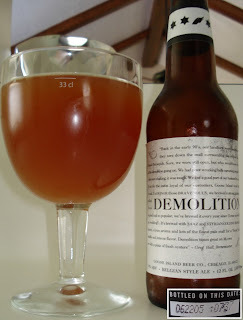 It was a very gloomy day so it seemed appropriate to drink a gloomy sounding beer... Demolition from Goose Island. Its classified as a Belgium strong pale ale. It's a beer my wife brought back for me while on a business trip to Chicago. The brewed on date stamped on the back of the bottle was 06/22/2005 with an indication that the flavours would continue to evolve over five years. It was a pretty hazy orange colour with very little head. It was a little sweet and if there had been any hop bite to it originally, its disappeared over the past (almost) 4 years. The 8% ABV was barely noticeable. It was not bad, but nothing spectacular either. As it turned out, the stormy sky cleared up and a few more Independence beers were enjoyed in the sunshine on the back patio. It's been just over 7 days since I brewed up my Session Beer. I've monitored the specific gravity in the primary fermenter over the past few days and it's time to transfer to the secondary. I'm also going to be dry hopping in the secondary with Cascade and Amarillo hops to impart some citrusy and floral flavours and aromas. The samples that I've tasted so far are pretty damn good. A little sweet maltiness with a slight dry and grapefruity bitter finish (I love how homebrewers can just make up new words to describe their beer and other homebrewers understand it). My birthday is the perfect time to dig around the beer cellar and dust off a few of those special beers that I've been saving. The first beer was actually not in my cellar, but one that's been resting comfortably in my fridge since I hauled it all the way back from Brussels... a bottle of Cantillon Gueuze 100% Lambic Bio. Several more beers that I purchased at the Cantillon Brewery are still in the fridge, awaiting another special day. This Saturday, April 4th, is the monthly tour and tasting day at Independence Brewing. Entrance is FREE and includes 3 beer sample tickets. If you buy an Independence pint glass (or bring one with you), you'll get that filled instead of an 8oz sample glass. Don't forget your ID and you may want to bring a lawn chair. Beer tickets are only handed out between 1 ~ 2 pm, so get their early. I'll be there, wandering around and helping to pour beer, check ID's and such. More information, including a map to the brewery, is available on the website. ** UPDATE ** Here are a few photos from the tour day and crawfish boil. I brewed a Belgium Strong Dark Ale for my 2008 Holiday Cheer beer last October and it turned out great. So great, that I decided to enter it in the National Homebrew Competition this year. I've never entered a beer into a homebrew competition before, but I figured if I'm going to do it, I should start with a beer that I'm really happy with. There was 345 entries in the Belgium Strong Ale category last year, so I'm certainly not expecting to win anything. I'm more curious to see what kind of feedback and comments you receive from the judges. The only feedback I get is from friends and other beer enthusiasts which, along with my own critique, is the only feedback that really matters. But, I'm still curious to see what the official "beer judges" have to say about it. We'll see what happens, but in the meantime, I'll just "relax, don't worry and have a homebrew".